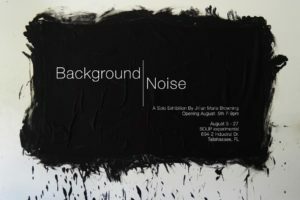 Background Noise is a solo exhibition by Jillian Marie Browning and curated by the recent FSU MFA graduate Brittany Watkins. “Background Noise” utilizes the three gallery spaces with a mix of sculpture, installation and video layouts. Doors open at 5 pm this Friday, reception starts at 7! Beverages will be available upon donation.